例：I first (explained) A. Then, I (reported on) B. Finally, I (touched on) C.
Today, we first saw that A. Then, we touched on B. Finally, we took a look at C.
So today, we (looked at) three things. A, B and C.
So today, my presentation was about three things. A, B and C.
Let’s do a quick review of the key points. So today, we first (looked at) A. Then, we (talked about) B. Finally, we (saw that) C.
I’d like to quickly review the three points we covered today. I first (explained) A. Then, I (reported on) B. Finally, I (touched on) C.
So let me summarize what I’ve said. I first (introduced) A. Then, I (clarified) B. Finally, I (gave an overview of) C.
I’d like to give you a quick summary of what we’ve seen today. The topics that were covered today were A, B and C.
To finish, I’d like to remind you of some of the main points we’ve considered. So, to finish, here are the main points that I wanted to cover today. That covers what I wanted to say today, so let me just go over the main points again. So, to sum up, we’ve seen that (our planet is in danger). To conclude, I’d like to point out that (there is a risk). In conclusion, (globalisation is inevitable). It should be clear from what we have seen that (our company is doing well). 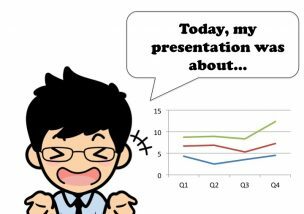 I hope that my presentation answered your questions regarding (our new strategy). In light of what we have seen today, I recommend that (everyone study English everyday)! In conclusion, my recommendations are (A, B and C). I therefore propose (the following strategy). Based on what I’ve said today, I’d like to make the following suggestions. It is clear that what we need to do is (to work harder). It is clear that we need to (work harder). Working together, let’s rise to the challenge! Let’s work together and find a way to (turn things around)! We need (new ideas) and we need (them) now! Train yourself and achieve your goals! I have (great) faith in (our ability to …). I am really looking forward to+ING! That brings me to the end of my presentation, thank you for your attention. Thank you for giving me this opportunity today. It’s been an honor to be here today. Thank you and good evening! It’s been a pleasure being with all of you today, thank you. Thank you all for being here today and taking the time to patiently listen to what I had to say. I wish you all a wonderful day! I will answer your questions now. I’d be happy to take/answer any questions. Let’s move on to questions. I’m sure you must have some questions, so I’ll be happy to answer them. The topics that were covered today were our company’s history, our current products and our future plans. I hope that my presentation answered your questions regarding our company. I am really looking forward to doing business with you.